My Uncle Hank Henry Bentley moved in with my parents before being deployed to Vietnam. At the age of 19, he was already a professional saxophonist having played with James Brown, Aretha Franklin, and many others. There’s a sound that he has on his horn that just oozes blues and I knew then that I wanted to chase that sound. My parents say I fell in love with the saxophone during this time. A year later while in fifth grade, my parents said I could play the saxophone in the elementary school orchestra, only to learn that there was no saxophone in the school orchestra; and the dream ended and went unfulfilled. In January of 2013, at the age of 53, I realized the darkness of the night’s cold winter, and the empty house was too much fun for one person to have. My wife Helen had recently taken a new job and it required her to work late. I quickly realized I needed to find something new to do, something new to learn, something to challenge me. 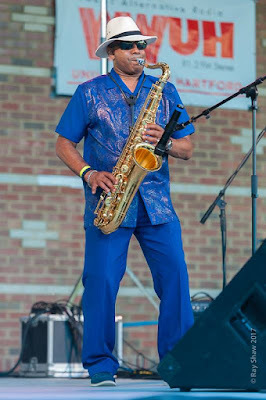 I seized the moment and drove down to Middlesex Music Academy and said; “I’m old, I can’t read music or play an instrument, but I want to learn how to play the saxophone and I am willing to put in the work. Matt Lefebve the owner of Middlesex Music Academy looked at me and said, “We can help you.” He said we just hired on a new saxophone teacher and you can start taking lessons with her in February”. And with that, I began a new journey. I had a new hobby and a secret which I kept from my wife, family, and friends for the next eight months. On my first day of class I met my new teacher Kendra Emery (a University of Hartford graduate), I promised her that day that I would work hard and I wanted to make her proud; that caught her off guard. I described my goals and shared a couple of stories about my Uncle Hank. She told me I had to have realistic dreams and be reasonable; I said, I am being realistic, for me. I asked Kendra, how much time do you think I need to spend practicing? Kendra suggested that new students practice 45 minutes every other day. I immediately went home and began practicing 2 to 3 hours a day, 7 days a week on my horn and I would spend another hour and a half studying and learning to read notes. When spring arrived, I told Kendra I wanted to surprise my wife for her birthday by playing her a few songs. I still had time; I had until October (which would equate to my 8 months). Often I would record a practice session and send clips to Kendra during the week to evaluate ( the poor lady had no idea what she signed up for). On one such day, I began to believe I was on the right track when I sent Kendra a sample of one of my songs I had been working on and she asked; who is that playing? She was surprised to find out it was me. Then the day came to surprise my wife and reveal for the first time, my secret. I made her a picnic inside the house (it was October and 40 degrees outside), with candles and wine and food, then I walked into another room (what is now known as the music room), turned on the accompanying backing track music and I began playing along; she cried. The next day, I recorded the 4 songs I played for Helen and I made a private YouTube video and released the songs to my family and a few close friends. The secret was out. Over the next 8 months, I added approximately fifteen more songs to my play list. I was content just playing alone, in my house, by myself, that is until my wife came home and said; you’re getting really good, I booked you a gig… (We won’t discuss my objections nor the fact that my objections fell on deaf ears). She said, don’t worry, it’s a small women’s group and you’ll just play during the social hour. After a lot of convincing and reassuring, I showed up at this “small gathering” 300 people in attendance, waiting for me to play. The gig went very well and I have been back to play a few more events for them. The next “small” event my wife booked me for was a few weeks later, here in Middletown for The Power of the Purse; again, this was not a small event. I have played for them every year since. That summer, my wife once again came home and announced, she had booked me another gig. This time, she had booked me as an opening act for “some band” on Monday nights at Hot Tomatoes in Hartford. So on my first day, I’m playing my set, and I see this guy walk in and sit down and listen to the last hour of my set. I immediately knew who he was when he walked in. It was Hartford Jazz Legend, Don DePalma …. After I finished, he walked up to me and said; hey kid, you’re pretty good. Do you want to sit in with my band? I recall thinking and saying to my wife, Holy Cow, I just opened up for The Don DePalma Jazz Trio …. (“Some Band”?). Well, In addition to my solo act, I have been playing with Don regularly since. Because Don opening the door and allowing me in, I have been exposed to not only Don and his trio and regular horn section, but he has exposed me to other local outstanding musicians who are on the rise as well as professional musicians, such as members of the Allman Brothers and Lyle Lovett’s Band to name just a few. These are opportunities “only” afforded to me because Don took me under his wing. In 2015, I apparently lost my mind and in the midst of trying to grow as a musician, I went back to college to earn my Master’s degree in an accelerated format. I completed my course work in 2016. A few months ago, a friend notified me that the Hartford Jazz Society was going to host their first Emerging Jazz Artist Competition. I figured I had nothing to lose and truly thought I’d ever get selected to move beyond my submission. I entered without telling anyone other than my wife. To my surprise, my music video submission was selected. Then we made it out of the first round and as of yesterday, I was announced as the winner of the Hartford Jazz Society’s first Emerging Jazz Artist. I still study at Middlesex Music Academy every Tuesday evening, except I have a new teacher to dive crazy, Ms. Kara Cook, and the other University of Hartford Graduate. At Middlesex, I am surrounded by a plethora of gifted musicians/teachers who continue to oversee my development and encourage me. Middlesex music academy allowed an old man to fulfill a child’s dream. The Staff of the Middletown Insider congratulates Gregory Sneed on his success in winning the Emerging Jazz Artist of 2017. That sir, is how dreams become reality. It doesn't drop in your lap. You peruse, you prepare, and when opportunity presents itself, YOU ARE READY. You earned this brother. Take a bow.